when someone replies back to your email. and you will get an SMS text alert when your email recipient replies back to you. with the word “urgent” in the subject title, for example. 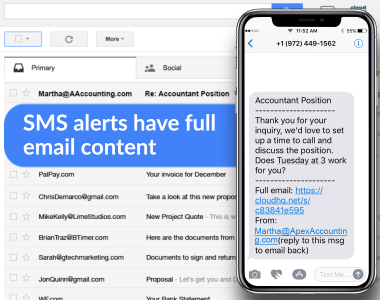 SMS Text Alerts is built specifically to work with Gmail and G Suite email accounts. 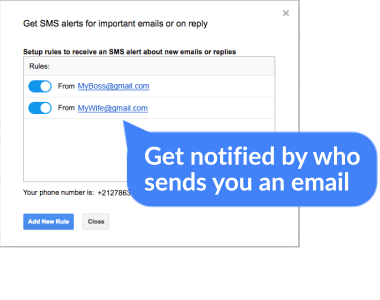 Once you’ve installed the Chrome extension, you can start receiving SMS text alerts with just one click—directly from with Gmail. 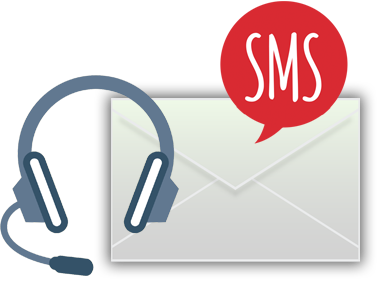 There is no need to log into a separate email service or website to manage your Gmail SMS Text Alerts. Compose your email like normal, but before you send it, just make sure you click on the new bubble icon on the bottom of your email to activate your SMS text alerts. It’s so simple! Now, when your email recipient replies, you’ll get notified via SMS text immediately. It’s all about the power of knowing when to take action. Just go to your SMS settings on the top right of your Gmail account, and enter in your mobile phone number. Simple as pie. You can easily set up rules where specific people who email you trigger the SMS text alert notification. This is essential for important customers, teacher emails, or your boss. They don’t even need to be replying back to your email. All they have to do is send you an email, and you’ll automatically get notified immediately on SMS text. Not sure who you should create a rule for? We’ve got you covered there as well. All you need to do is set up email subject keywords so that anytime something in the email subject gets triggered, you’ll get your SMS text alert notification. Think about words to include like: urgent, help, servers, or maybe it’s the name of your case number, your medical test, etc. Using keywords in your subject headline is so easy and logical so that you never miss anything important in your email ever again. Once you receive your SMS text alert from cloudHQ, you could be anywhere. And because of that, we realize that the full content of your email should be available to you right from your phone’s SMS text. So, we made that happen for you. You won't even need to check your email account with our Gmail SMS Text Alerts. We designed this tool with as few limitations as possible - including price limitations. Because of that, Gmail SMS Text Alerts is 100% free to use for anyone using Gmail. If you want service, you’ll need to pay for a premium account for a nominal monthly fee. Who Should Use Gmail SMS Text Alerts? Employees who always want to be responsive to their boss to look like they’re very reliable. Job seekers who want to respond to emails from potential employers to make a good first impression. Salespeople who want to stay on top of their emails with clients so that they can close more deals. Venture capitalists and investors who want to know when partners or founders responded to their emails so that they can quickly get in on a really good investment round. Realtors for when important emails come in to help them close the sale of their properties. Lawyers who want to make sure they’re responsive to judges, firm partners, or opposing counsel. Managers who want to be responsive with their employees to increase talent retention. Marketing or public relations teams that want to see responses to emails in real time so that they can start the next step for their promotions. Customer support employees who want to keep track of urgent support tickets. Administrative assistants who want to manage their employer’s appointments more efficiently. Investment bankers who have demanding clients or bosses, and need to demonstrate that they always have a responsive, “can do” attitude. Ultimately, this is a great tool for anyone who wants to be on-the-ball.